As the 2014 Winter Olympics in Sochi draw nearer, debate is heating up about Russia's anti-LGBT policies. 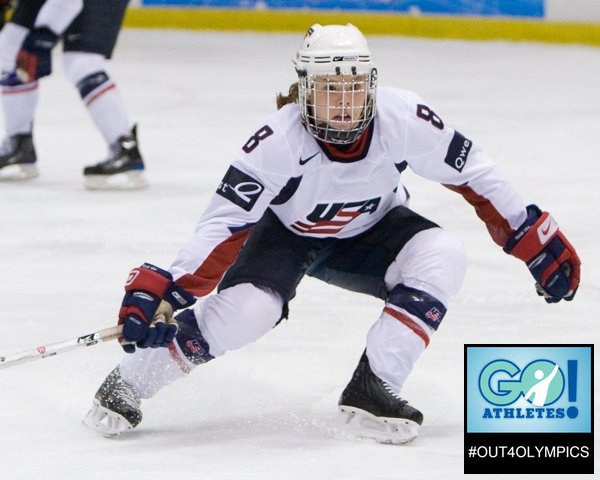 Former Olympic Women's Ice Hockey player Caitlin Cahow was kind enough to speak with me, sharing her take on boycotting Sochi, the tension that LGBT athletes face today, and why she loves sports. Cahow, a two-time Olympian, sits on the board of the Canadian Women's Hockey League (CHWL). Recently, she has spoken with USA Today and AfterEllen.com, and at Boston Pride with Patrick Burke of the You Can Play Project. Additionally, she helped create the You Can Play Project video for the CWHL. Cahow is currently enrolled at Boston College Law School and is a graduate of Harvard University and The Hotchkiss School. Avery Stone: You're a two-time Olympian. Why do sports matter so much to you? Caitlin Cahow: Sports -- and along with that, the philosophy of the Olympics -- inspire people to be the best versions of themselves. Through sport, we have to put ourselves out there and make ourselves vulnerable to failure in order to succeed. And it's impossible to talk about how important sports are to me without emphasizing the female athlete role models who came before me -- starting with my mother, who was an elite figure skater. My early impressions of women were of strong, athletic, powerful, and intelligent women. This made me focus my life on becoming one of them. Stone: Let's move to a different and more complex topic: Sochi. Obviously, there has been a lot of media attention on Russia's anti-LGBT policies, and a lot of debate about whether or not American athletes should boycott the Olympics. Do you think American athletes should compete? Cahow: My argument is simple. Did you see Jesse Owens saying, "I don't think I'm going to participate in the Olympics in Germany because it's an affront to my race?" No. He went. He competed. He won. He did it silently and peacefully. He demonstrated the greatness of who he was as an African-American athlete. It's precisely the same philosophy we should be taking to Russia. I don't think any athletes are going to go over there just to protest Russian policy. That makes no sense. They're going to go over there because they want to compete. Some of these events are decided in 30 seconds. Thirty seconds can win or lose an Olympic medal, and that's the only 30 seconds in your life you're going to get the opportunity to do it. There's absolutely no reason in my mind to boycott an Olympics based upon ideology -- not when the whole purpose of the Olympics is to create a free-market exchange of ideas to bring out the best in all of us. Stone: In addition to their sports, elite athletes must also deal with being in the media spotlight. Do you think athletes feel pressure to appear a certain way? Cahow: I think one of the problems you run into as an athlete is that you're in the limelight, and you have a very short amount of time to be there. Your focus is on your performance. You want to succeed for your team and our country. That said, I know that many athletes feel restricted in the ways in which they can express themselves in order to be seen as mainstream or appealing; the all-American branding that is put onto international-level athletes is pretty strict. There isn't a whole lot of room yet for LGBT athletes. It's still a huge risk in the minds of many athletes to step outside that definition of this all-American athlete. All elite athletes struggle with the public-vs.-private tension, but I think LGBT athletes may have a little more to think about in Sochi. Stone: So what do you think the primary responsibility of athletes in the media is? Cahow: Athletes are athletes. Honestly, it's our responsibility to be able to form coherent answers and speak intelligibly about our sport. I don't think it's the responsibility of athletes to always be the spokesperson for every agenda. More significantly, I don't think anybody in the entire world should have to proclaim their sexuality. Stone: Do you think the media focuses too much on players' sexualities when they do come out? Cahow: I think it's ridiculous that when Brittney Griner gets drafted first in the WNBA draft, a large portion of the articles that come out are about her sexuality and her gender expression. You've got to be kidding me. She has to be one of the greatest American athletes of all time. It's just ridiculous. I do believe it is important for athletes to feel like they can express themselves however they want. If you want to be a spokesperson for a certain identity, then more power to you, but you should feel free to ignore inane questions that have nothing to do with your profession. Stone: Do you still see tension there, though? Cahow: Is there a certain amount of responsibility to speak out because you know somewhere, sitting in a living room in Mississippi, there's a girl who's going to be reading this interview and thinking, "I really wish that more athletes and public figures would come out and make me feel like I belong?" Yes, that responsibility does not go unnoticed, and for the people who do choose to become spokespeople, God bless them. It's a remarkable gift to be able to give. At the same time, there are some people who are more suited to be outspoken, and there are some people who aren't. That's how you're made, just like your sexuality. Whether you're introverted or extroverted is just one more component of who you are. I won't think less of teammates or athletes who choose to remain silent about their personal lives. I'll be really impressed with those who choose to speak out. But at the end of the day, the fact that American athletes will be in Sochi, representing a country that has made the most dramatic shift on this social policy issue in the last few decades, is what matters most. Stone: Do you see yourself speaking specifically on behalf of LGBT athletes in the future? Cahow: It's so funny because I actually don't. Generally, it's funny to me that I have spoken out about LGBT issues when many others have remained silent, because any of my teammates would tell you that I am an incredibly private person when it comes to my personal life! I guess for me it has always come down to how I want to be thought of when I go to shake someone's hand in a professional setting. Do I want to be thought of as an elite athlete, or a confident lawyer, or an inspiring public speaker? Or do I want be labeled and categorized by my sexuality the moment I enter the room? This issue goes beyond the struggles of athletes. Stone: Do you see this struggle illustrated in women's ice hockey? Cahow: Yes. When we tried to do a video for the for You Can Play Project for the Canadian Women's Hockey League, we had a difficult time getting gay athletes -- as well as straight athletes -- to participate. It was like pulling teeth with many people, whether or not it was articulated, because the assumption is that is there is a "guilty by association" philosophy with female athletes. You don't want to be perceived as being a lesbian, and if you are a lesbian, you don't want to fit into the stereotype. You don't want to gratify that stereotype with a response. That's something unique to women's sports. The NHL had an abundance of allies waiting in line to stand up and support LGBT athletes in their videos. Male athletes don't have the same stigma attached to their participation in sports. My prediction is that as we move closer to Sochi, you may see more male athletes coming out and publicly saying, "We don't agree with your policies, Russia, but we're going to show up, and we're going to compete. We support our LGBT teammates." I think it's going to be pretty silent on the women's side. The fact that this issue is so completely and increasingly gendered gives me pause and concern. Stone: How have your various teams treated the issue of sexuality? Cahow: I've been on teams where it was completely unspoken. It was a very "don't ask, don't tell" environment for all of the athletes. There were a lot of gay-identifying athletes who felt stifled and very much suppressed because of that environment. I've also been on teams where people are very open to the point where the conduct is kind of flagrant, and I've felt uncomfortable in that setting too. Sexuality is such a natural part of everyone's lives; if you're on a team with people that you're very close with, you want to be able to be comfortable in that environment and gain support and confidence from those teammates. You have to decide as a team what kind of culture you want. The mature teams that I've played for have had a good handle on this balance. Usually, those are the teams that win. Stone: Is it correct that you were not technically out for your first two Olympics? Stone: Your coaches didn't ask either? Cahow: Are you kidding me? Stone: So now what do you think will bring out LGBT athletes into the mainstream? What will shift the dialogue? Cahow: I think if LGBT athletes start to mention, when they're interviewed, something as simple as being grateful for their significant other's support, then it becomes more about the personal interest stories of individual athletes instead of the blockbuster coming-out story. It turns it into the type of dialogue that every heterosexual athlete has access to. In interviews, you ask heterosexual athletes, "How do you have strength every day to keep going?" That's one of the most common questions. Every single heterosexual athlete says something like, "I have my faith, I have my coaches, I have my family, and I have my wife and kids." That's always the answer. If you ask a gay athlete, there's never going to be a mention of a significant other. Ever. If, all of a sudden, some gay athlete said, "I really lean on my faith" -- because gay athletes can have faith too -- "my coaches have been super supportive, I look to my family, and my girlfriend/boyfriend/partner has always been really supportive. She/he's been on the sidelines at every game. You know, she/he's been to two Olympics," if that became part of the toss-in of things that make someone a great athlete, that changes the debate from making a social statement about sexuality to making a human statement. The political and legal issues will always go on, but it has to start being a human question. Stone: Is that part of what draws you to speak out now? Cahow: I want to shift the dialogue. I'm not out to make a statement about me, personally, but I'm out to change the conversation. You don't have to think about these issues in black and white. You can think of it in shades of grey, because that's where most of us exist on the spectrum. And that spectrum applies much more broadly than just to sexuality. You're never going to see me being all of one thing or none of another. It's misrepresenting me. It misrepresents the diversity of the human experience. We all exist in some shade of grey, and our need and desire to put people into boxes is just counterproductive and unimaginative. The shades of grey are much more compelling. This piece originally appeared on GoAthletes.org.